I'm looking for a guidebook to visit Menorca. For other travels I used to get the "Lonely Planet" guide, but there isn't any of Menorca, and I think that get one of "Spain" is too wide. Where I can find a good guide of Menorca? I like Eyewitness Travel Guides by DK. They have a Mallorca, Menorca & Ibiza book. I find "Menorca Berlitz Pocket Guide" to be a good option, is pretty extensive, has very usefull information and is not expensive. One good place to start looking for interesting places in Menorca is http://www.travelmenorca.co.uk/guide/index.htm, it's not very extensive, it only give short descriptions, but is a good start point. There are phenomenal beaches, specially the coves that in Menorca are named “Cala ….”. Some of these coves are amazing places, I especially liked “Cala Macarella” and the adjacent cove “Cala Macarelleta” (Macarelleta is a diminutive of Macarella) that’s a smaller cove adjacent to the main Cove. There is a beautiful footpath between the two coves (bordering the sea over a cliff). One important thing about Menorca coves is that many of them have parking for cars and motorcycles a few hundred meters away from the cove, so you will have to walk a little, but this is not the most important thing, the important fact is that when that parking is full they don’t allow more people on the cove, so if you want to go to a concrete cove, go early on the morning or you have very good chances of not being able to accomplish your goal. Another important thing about Menorca is that the roads to the coves and beaches use to be very narrow, so if you plan to rent a car, rent a little one. And last but not least, if you like to eat fish you MUST go to “Fornells” (a little fishing village on the north coast of the island) and order a “Caldereta”. 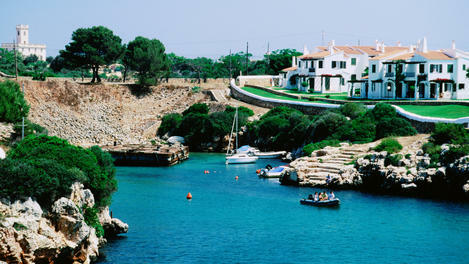 Introducing Menorca - Menorca Travel Information and Travel Guide - Spain - Lonely Planet. Not the answer you're looking for? Browse other questions tagged spain islands guidebooks or ask your own question. I went on holiday in 2002 and would like to go back again one day. Could I find out where I went?